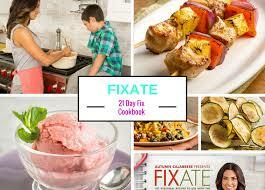 Ok, if you know me and you follow me on Facebook, you KNOW I'm a HUGE fan of the 21 Day Fix. I host monthly boot camps with that program and I'm incredibly passionate about it because it has changed my life AND my family's! It's an incredible program that not only moms can benefit from, but dads and the kiddos too! Balanced, proportioned eating without the need to measure, count calories, estimate points or use those pesky food scales! So, when I found out Autumn Calabrese was coming out with a cook book for the program with over 101 recipes for it, I was like a kid in a candy store and now, it's just days away from being released! It will be available starting on July 14th but we get a sneak peek at 5 recipes from it NOW!! Give them a shot and tell me what you think! !